Among the side effects of the war in Iraq is the deteriorating safety condition of the Christians in that country. The overthrow of Sadaam Husein unfortunately created a power vacuum has been filled by Muslims whose interpretation of Islam is dangerous to both political dissent and to religious minorities. The recent news coming out of Iraq is not encouraging. According to Associated Press, Iraq's Christian community is mourning the murder of three Christians killed in two separate incidents. The Associated Press reports as follows. "An Iraqi Christian leader told mourners Monday that the slayings of three Christians a day earlier was an act of religious terrorism that raised fears of more sectarian violence in the northern city of Kirkuk. The attackers shot the victims at point-blank range in the head and chest at their homes. "Innocent people who have no relation with politics and never harmed anyone were killed by terrorists in their homes just because they were Christians," said Chaldean Archbishop Louis Sako a day after gunmen attacked two Christian houses in separate attacks." The killings took place in Kirkuk, a city about 190 miles from Baghdad that is riddled with ethnic divisions and hostilities. In a country that is at a crossroads between democracy and theocracy, the future of Christians, Yazidis, Mandaeans and other minorities is uncertain. No one has claimed responsibility for the killings, although some have pointed to Al Qaeda as a possible culprit in the anti Christian terrorism. Because nothing was taken in any of the killings, religious hatred is suspected as a motive. Many Christians fear that a sudden and complete pullout by the Americans from Iraq would lead to wholesale slaughter of Christians. AINA News reports as follows of the widespread concern in Iraq's Christian community. We know if America leaves they will come and kill us. They think we have something to do with them and they think we have money. The Iraqi government is happy if all Christians leave. They say they want us to stay, but they don't mean it. If they mean it, then they would protect us more," says Masoud Gallozi. Many are distrustful of the promises of the Obama administration AINA reports as follows of the reaction in America's Chaldean community. "Chaldeans in America are frustrated over President Obama's handling of the Middle East issues. "There were many Chaldeans fooled into believing the new administration would pressure the Iraqi government to get serious about properly protecting Chaldeans. These Chaldeans sent an e-mail of a letter by Obama and his people showing he was concerned. It was just another lie from this man. A lie that is leaving our people vulnerable. Those who supported him are partly to blame," a frustrated James Selmu declares." The perceived wealth of Iraq's Christian community combined with their small numbers makes the Chaldeans an easy target. The community has a presence in Iraq predating the arrival of Islam by centuries. Their language and culture is a living link to the beginnings of Christianity. The demise of this ancient community would be not only a moral failure but a loss to the world as well. The situation of Assyrian Christians in Iraq is also not encouraging. Since the 1979 revolution, the Assyrian Christian population of Iran has dropped from 100,000 to about 20,000. According to Iran Press Watch, persecution of Christians has recently been stepped up in Iran. Iran Press Watch reports as follows. International Christian Concern further reported as follows. “According to the Farsi Christian News Network (FCNN), Iranian security officials searched the apartment shared by the two women and confiscated their personal belongings before they handcuffed and took the Christians to Police and Security Station 137 in Gaysha, west of Tehran. After appearing before the Revolutionary Court on March 18, the women were sent to the notorious Evin prison. Iranian officials told the Christian women to post bail at a staggering amount of $400,000 in order to be released from the prison. The harsh government response has come in response to the conversion of some Iranian Muslims to Christianity. A bill before Iran's parliament would make conversion out of Islam a crime punishable by death. 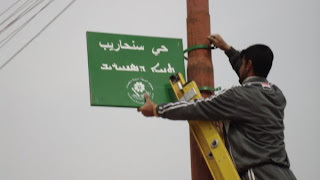 In one of the few pieces of good news for the Assyrian community, Assyrian street signs, sponsored by Western donors are being put up in Northern Iraq according to AINA, the Assyrian International News Agency. This is the first time in Iraq that Assyrians have had street signs in their own language. It is hoped that the signs will be a common sight throughout the Nineveh Plain area where Assyrians commonly live.